While I was doing some blog hopping last night I read one of my blogger friend post about her mom's birthday on April. My gosssh! If I wasn't reading that blog I would have completely forgotten about my Mama and Papa's birthday's next month. So, today I went shopping again and found something for both of them on their birthdays next month. Their birthday falls on the same month but a week apart, I thought it would be easy for us to send them gifts together right? Hayss another expense for the US postal flat rate box. Its a kind of expensive but it is well worth it to give some small gifts to our parents since they are well deserving of it. I thought the best surprise gift for Mama would be a piece of Jewelry and I thought a necklace would be the best for her, I was really happy I came up with that idea. 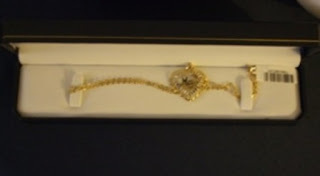 I bought a 10k gold necklace with heart pendant. It has a word MOM in it. For Papa, he has asked a bunch of times for sunglasses. He wants sunglasses for driving his old car and motorcycle. 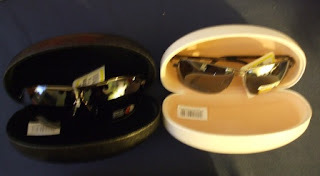 So I was able to get 2 pairs of good sunglasses for him and it didn't cost as much as Mama's gift but I am pretty sure he would definitely love to wear them-:) I remember the last time I sent a box home I forgot to put sunglasses in the box and I know he was a bit disappointed because he was expecting it. He has been asking for sunglasses for sometime now. I hope it will be a surprise for them and I can control myself not to reveal our gifts when I call. I know, on their birthday they will ask me for some money so they can have a small party. Again, that will be another expense for next month! My babe Dako spoiled them a lot from the very beginning which is why they are always expecting to have a Birthday Party every year. It will be held either on Mama's birthday on the 24th April or on Papa's birthday on the 30th. They were born less than one week apart because not only same month but also they were born in the same year. Hard to believe huh! 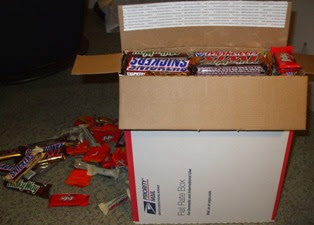 Of course every time I send them the gifts using the US postal service I always have to include a whole bunch of chocolate lol! 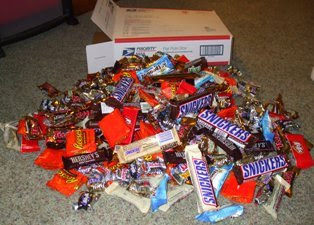 My nephews and nieces love to eat these chocolates especially from the US. Every time they receive the package btw, they share with the whole village. I know about it because my nieces and nephews tell everybody that they were eating chocolates from the US hehe sounds funny but its true!